We strongly believe that the best way to do business, for everybody involved, is to provide clear honest prices. 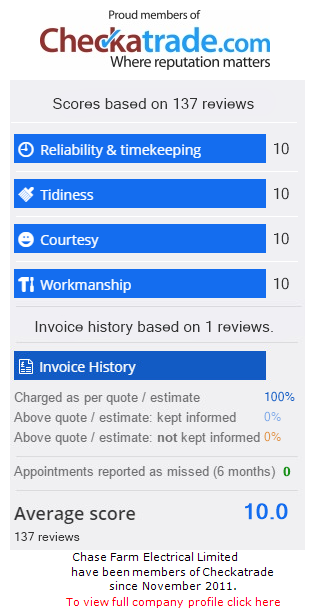 Wherever possible we will endeavour to provide a fix price quotation, although, for general work and call outs please see below our white, grey and blue price options. All prices quoted include relevant testing and certification as well as appropriate notification to building control. Materials and documentation to remain the property of Chase Farm Electrical until all invoices are paid in full. Unless otherwise agreed, full payment required on the day of satisfactory completion. Unpaid invoices may be subject to an administration charge at the general work rate. If you would prefer a free-fixed price quotation or have any questions please do not hesitate to contact us today.